The Lutheran Church—Missouri Synod began work in Panama among the English-speaking community in 1941 and among the Spanish-speaking populace in 1980. The LCMS began supporting mercy ministry in Panama in 1988 with a grant for emergency food assistance. Since then a dozen grants have supported health services, education, well and sanitation systems, deaconess training, children’s ministries, and disaster relief. Most recently, a disaster grant was awarded to the church in Panama to provide emergency supplies to families affected by flooding. The LCMS provides support to ministry in Panama carried out by the Lutheran Church of Panama. Together, they develop pastoral and lay leadership through the theological education by extension program and focus on diaconal ministry (mercy ministry). Mission work in Panama also benefits from project support that covers general day-to-day costs of the LCMS' regional support office in Panama City and administrative costs of the Lutheran Church of Panama. Children Christian Concern's Society, an LCMS Recognized Service Organization, provides educational scholarships for students and teacher salaries at Lutheran schools in Panama. 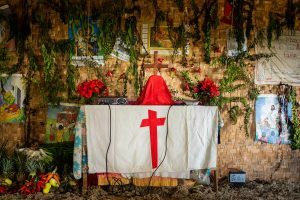 The Evangelical Lutheran Church of Panama has grown to a baptized membership of more than 200 people in six congregations and preaching stations. The church operates three preschools and three kindergartens.